Serve these fish cakes with steaming hot rice or stuff it in a sliced baguette along with the pickles. 1. Preheat oven to 350°f. Lightly spray a12-cup muffin pan with oil. 2. Place half the fish and prawn meat, coconut milk, cilantro, curry paste, sugar, oil, and fish sauce in a food processor. Process until almost smooth. Transfer to a large bowl with remaining fish and prawn meat. 3. Divide mixture evenly among the muffin cups. Smooth surface with the back of a spoon. Bake for 10 to 15 minutes or until cooked through. 4. Meanwhile, make the mixed pickles: combine vinegar and sugar in a small saucepan. Stir on low heat until sugar dissolves. Place carrot and cucumber ribbons in a bowl. Pour warm vinegar mixture over and chill until ready to serve. 5. 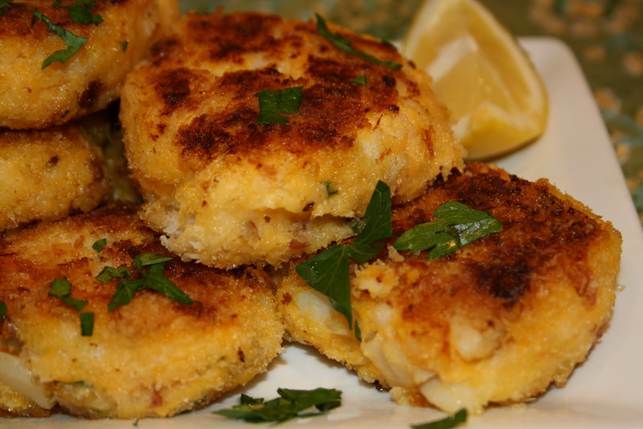 Serve fish cakes, hot or cold, with mixed pickles, lime wedges, and extra cilantro leaves.